The power of friendship is on full display with Funko My Little Pony Power Ponies Mystery Minis. The set includes twelve base figures and three retail-specific exclusives. While reading a comic in the fourth season of My Little Pony: Friendship is Magic, Spike accidentally transports himself and the others into the comic book. While in the comic's city of Maretropolis, the Mane Six obtain super powers and are transformed into Power Ponies with Spike as their superpowers-free sidekick. 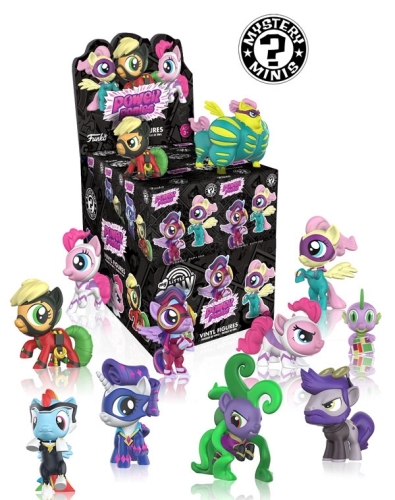 Funko My Little Pony Power Ponies Mystery Minis are a genuine mystery as they are issued in a blind-box format with 12 boxes per case. Every box containing one 2 1/2" Power Ponies mini figure is identically packaged to keep the element of surprise. There is a total of fifteen figures including three issued exclusively for Hot Topic, which will make collecting the entire set a little more challenging. However, the individual figure odds remain 1:12 for both formats.